Dr.Sreelatha is an American Academy certified and highly experienced cosmetic surgeon with over two decades of excellence to her credit. A diplomat and Certified Member of the American Academy of Aesthetic Medicine, Dr. Sreelatha has undergone extensive training with some of the most reputed names in cosmetic surgery spanning USA, Europe & Asia pacific over years. 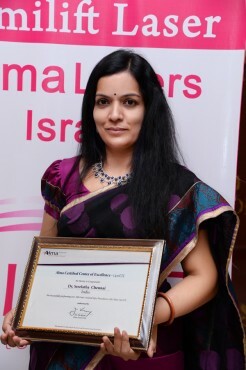 In addition to the above, Dr Sreelatha is a research scholar on obesity and liposuction.These have given her a unique understanding of various perspectives and she has successfully used various procedures not only for achieving an aesthetic body appearance, but also to provide a good solution for seemingly unrelated issues such as joint pains and infertility. The idea behind her cosmetic surgery clinic in Chennai is to share the benefits of her expertise with her countrymen and women. Dr.Sreelatha has an open discussion with all her patients to completely understand their needs and effectively guide them in achieving their aspirations. Every little question is answered personally and ensuring that patients are absolutely comfortable at every step. Fat deposits are unique to every individual and hence, a detailed initial assessment is carried out. Patients are educated and a unique personalized strategy is formulated, and finally implemented, to deliver personalized results that are emotionally fulfilling, medically compliant and highly satisfactory. Dr.Sreelatha regularly attends workshops and seminars around the world to be abreast with the latest developments and has also been invited as a keynote speaker in many institutions. She is also a Member of World Society of Antiaging Medicine, American Academic of Bariatric Physicians and International Mesotherapy Society. She is also amongst the few Indians who have trained in Robotic Hair transplantation directly under Dr. Pierre Bouhanna, a pioneer in hair transplantation. A diplomat and Certified Member of the American Academy of Aesthetic Medicine, Dr. Sreelatha has undergone extensive training with some of the most reputed names in cosmetic surgery spanning USA, Europe & Asia pacific over years. In addition to the above, Dr Sreelatha is a research scholar on obesity and liposuction. Prof. Dr. R. Gunaseelan is the Director & Chief Surgeon at Rajan Dental Institute with over 25 years of experience in dentistry Implantology and Maxillo - Facial surgery.